Build_Architecture / Interior / Construction Muse Template Created by CreativeRacer. This templates have specific characteristics, namely: Responsive Muse Template is a uniquely designed website template designed in Muse with a flat and modern look. This is a minimal, flat, clean & modern Template for anyone who wants to build an amazing architecture website few minutes. It is suitable for any architecture, construction, corporate, . 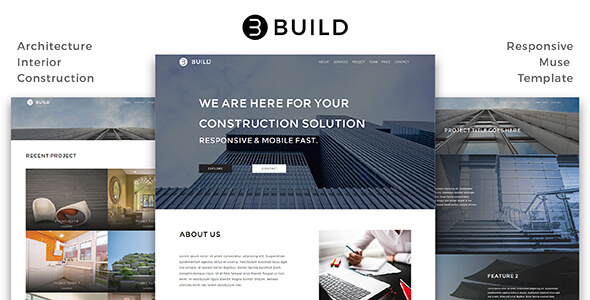 You can use this Build_Architecture / Interior / Construction Muse Template on Muse templates category for agency, architect, architecture, building, construction, corporate, creative, design, interior, multipurpose, muse, one page, portfolio, project, responsive and another uses. Responsive Muse Template is a uniquely designed website template designed in Muse with a flat and modern look. This is a minimal, flat, clean & modern Template for anyone who wants to build an amazing architecture website few minutes. It is suitable for any architecture, construction, corporate, creative or interior farm.